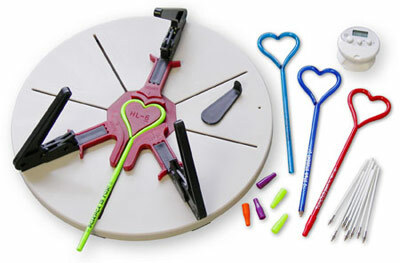 The Twisted Pen Factory™ is a complete table top factory designed by a teacher for your students. Pens can be made by your students for fundraisers, awards or business education. A complete start-up kit is available for only $499 - includes supplies, parts and seven shape molds (heart, star, electric guitar, cat, puppy, treble clef and apple). I am the CEO of The Bentcil™ Company in Indianapolis with an MS in Education from Indiana State University. The Bentcil™ Company is a new twist in writing instruments. The Bentcil™ name is recognized world wide as a quality manufacturer of theme shaped pens and pencils. People ask me how I came up with the idea of the bent pen. I point out, I am the sum total of all my experiences. The Twisted Pen Factory™ is developed from the experiences of manufacturing bent pens and pencils for the promotional and retail markets including the largest theme parks worldwide. My experience includes teaching industrial arts plastics. The program I developed was most likely the largest general education plastics program in the United States from 1970-1979. The Twisted Pen Factory offers students the opportunity to explore, organize, manufacture, market and distribute a viable and highly desirable product. The Twisted Pen Factory™ is my gift to the classroom and the entrepreneurial spirit of American Youth. I am BENT on serving the classroom.